The boring benches installed in urban areas around the world are purely functional: you take a seat for a little while, and then you leave. 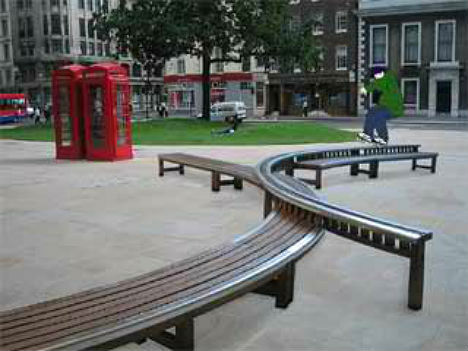 But why shouldn’t public furniture be visually interesting, comfortable and even interactive as well? These 14 chairs, benches, loungers, tables and more often double as art objects, with designs that consider a wide range of needs. 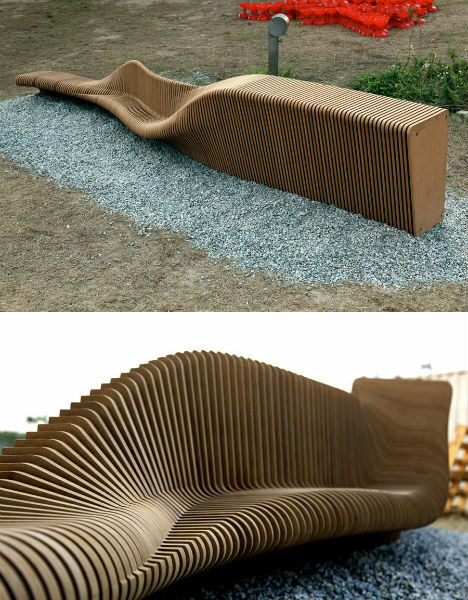 The flowing landscape-like shapes of The Swiss benches by Alfredo Häberli fill the needs of various personalities who might use them while waiting for the bus or stopping for a break. 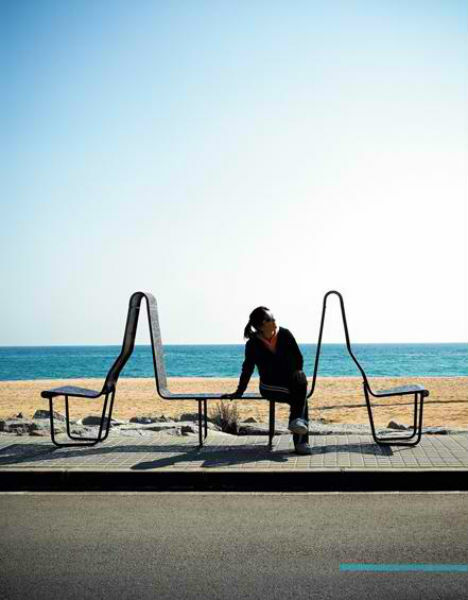 The benches, which have names like ‘El Filosofo’ (the philosopher) and El Solitario (the loner), include seating that either allows socialization with others or discourages it with separated seating. One bench, ‘El Banquero’, offers not a seat but rather an elevated platform for standing and eating, using a laptop or reading a newspaper. 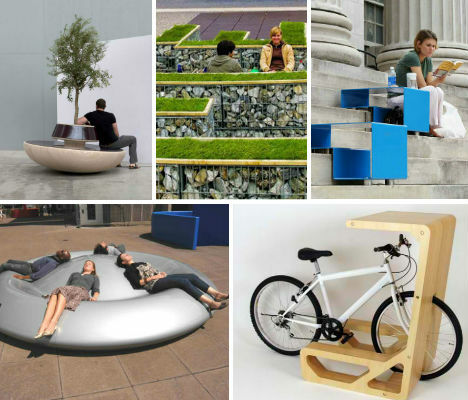 This clever and eco-friendly idea for public seating includes wooden benches and grassy platforms supported by wood and stone bases, bringing greenery to spaces where there was none. 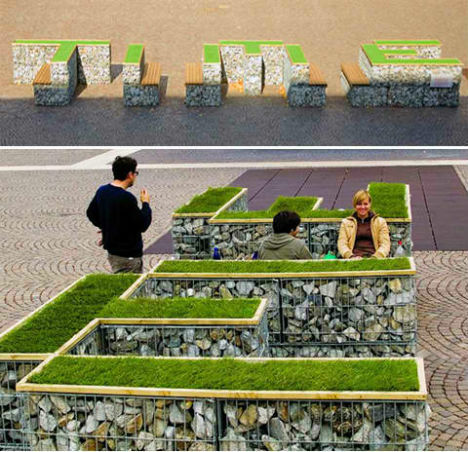 Spelling out the word ‘TIME’, the benches were installed by designer Dominik Schwarz at the Piazza-Tribunale in Bolzano, Italy for the Time Code Festival. People join together to lounge in the sun or gaze at the stars on designer Peter Newman’s ‘Skystation’, a public seating concept displayed at London’s Hayward Gallery. 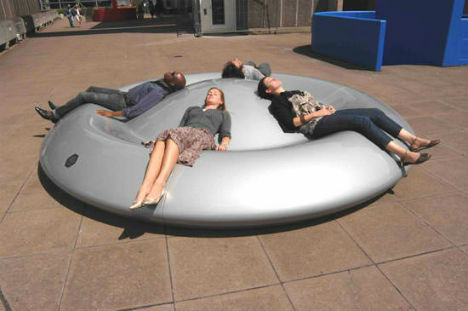 Resembling a miniature UFO, the round lounger has curves that perfectly support the reclining human body. People rest and relax on public steps anyway, why not give them a comfortable way to do so? 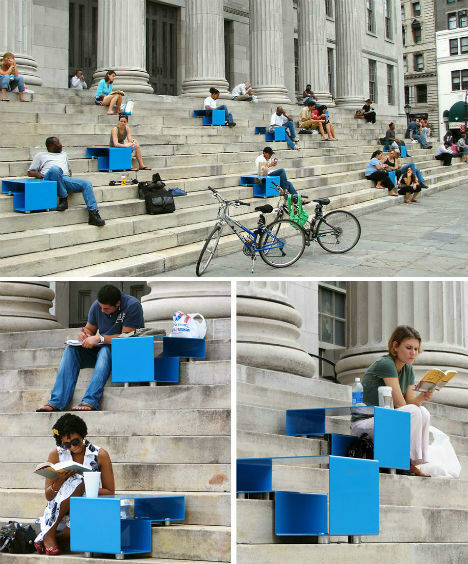 Stair Squares, a concept by Mark Reigelman, are little blue tables that fit perfectly onto steps to offer little tables for eating and reading. The stairs were installed on the front steps of Brooklyn’s Borough Hall in the summer of 2007. 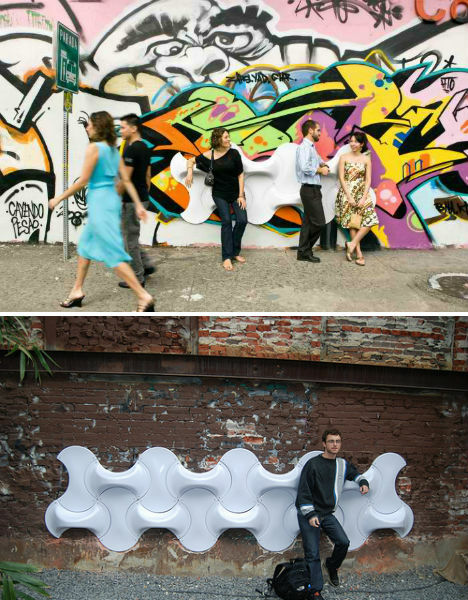 This design proposal for a modern urban bench considers the varying needs of different people who might use it. The designers, Rocker Lange, use a computer program that takes data about the intended site and creates a form that offers multiple seating solutions including a flat bench, a sloped area for lounging and a seat with a back. This smart set of hydraulic benches is flush with the ground when not in use, but those who want to sit down can simply pull a lever and watch it rise up. 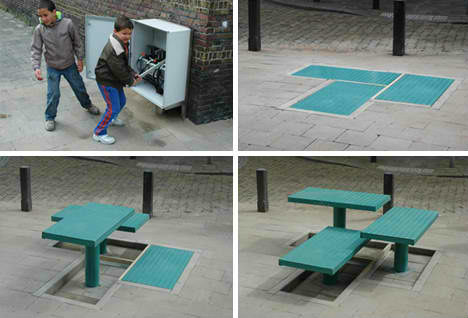 Designed by Carmela Bogman and Rogier Martens to give the public a little more control over the urban environment, the benches can be raised to the desired height for the particular people who want to use them. 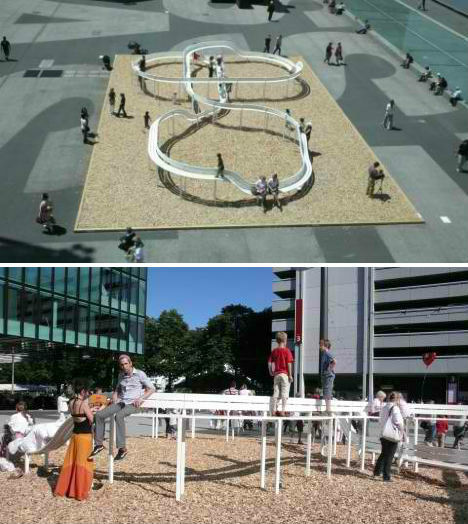 What looks like a roller coaster or a slide from far away is actually a fun and clever bench. 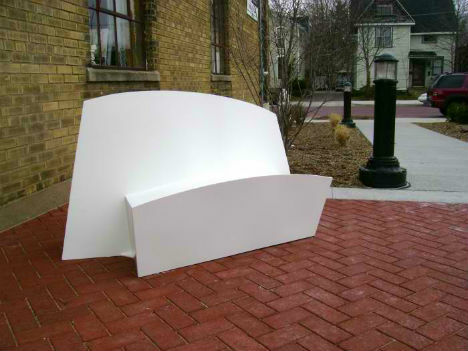 The Loop Bench was installed at Art Basel Miami in 2009, and was designed by Jeppe Hein. 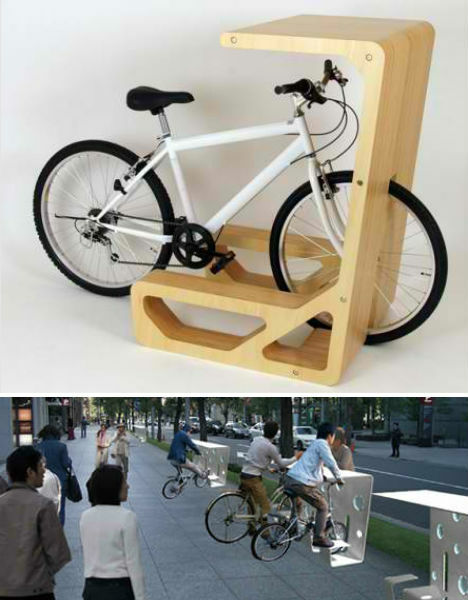 What if people could simply use their bicycles for seating? The clever PIT IN by Store MUU functions as both a bike stand and a table, so that users can simply ride right into place for a coffee break or to quick emails. Made of plywood for interior use and plastic for exterior use, the PIT IN could be ideal for street-side cafes in cities with heavy bicycle use. Pieces with seats on either side fit together to form circles in this interesting modular seating design. 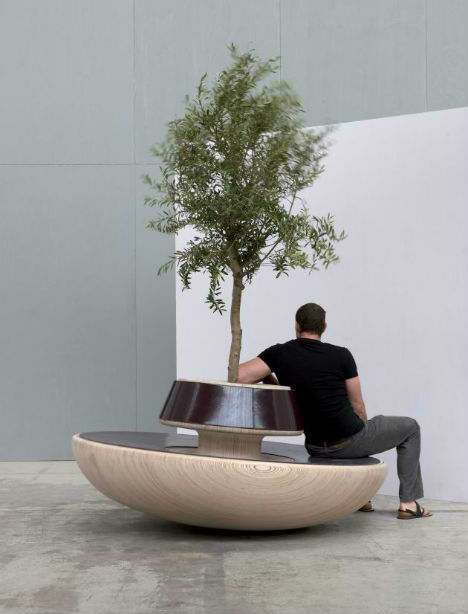 The circle of seating offers two modes: one that is closed off from the environment, providing a sense of solitude and separation, and one that allows the user to face out toward the city. 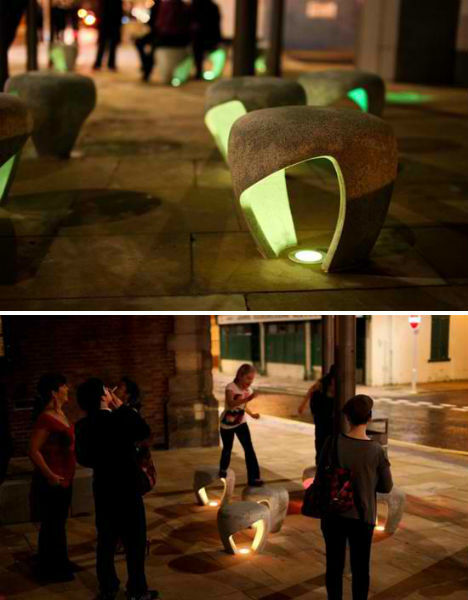 Designed for the city of Sunderland, England, these illuminated stools by Charlie Davidson offer a small gathering place. Their rounded forms and rough textures call to mind boulders and stones, and the cut-outs in the center of each reflect light and give the stools a sculptural look.